In this LBGTQ sweet short love story, New York Times bestselling author Gail Carriger brings her comedic voice to contemporary fiction and m/m romance. Prequel to The Sumage Solution. (11,000 words ~ 43 pages) First published in The Mammoth Book of Paranormal Romance 2 (2010). 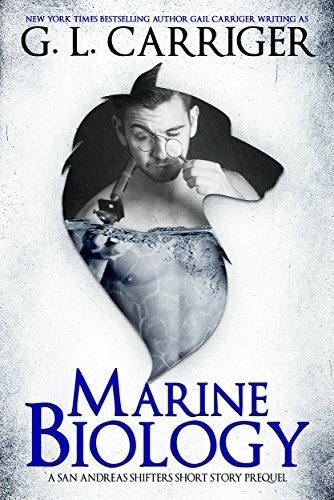 Marine biologist Alex is a werewolf with secrets and the fact that he's gay is the least of them. He just doesn't fit in with the other werewolves in his pack and that makes life extremely difficult for him. They don't understand his love of fish over steak and he's never going to enjoy drinking and partying the way they all do. When the wolves are approached by some merfolk who need help investigating the illegal activities of the selkie mafia Alex is given the job of liaison. His family are hoping he'll fall for the beautiful mermaid Giselle but Alex is much more interested in her brother Marvin. This was a really fun short story full of Gail Carriger's trademark witty banter and plenty of humorous flirting between Alex and Marvin. As a short story this didn't have much time to flesh out the characters but I thought they made a really cute couple even if I did want to spend more time getting to know them. Marine Biology works well as an introduction to the main characters but I'm glad that future books will be longer because I think this just needed a bit more page time to really give the characters a chance to shine.